Indonesia population of more than 262 million (as of the beginning of 2018) has placed Indonesia at the top 4 spot as one of the highest population countries, among the 193 nations of the world. According to World Bank, people aged 65 years and above in Indonesia have reached 14.4 million. There is a 40 per cent growth of elderly people by 2025, which will also place Indonesia under the spotlight, becoming a fast ageing country. This shocking rise of the ageing population will have an enormous impact on the economy level of many industries, especially the medical devices and healthcare sectors. The CAGR of medical devices is at 16.7 per cent for 2013-2018. In 2018, Indonesia’s medical equipment market is predicted to exceed IDR 13.5 billion (USD 1 billion). The total value of imported medical devices is estimated to reach IDR 28.4 trillion (USD 2,030 million) in 2018. For “Personal Care” segment in regards to the healthcare sector, the revenue amounts to IDR 6.3 trillion (USD 450 million), with an annual growth rate of 14.9 per cent (CAFT 2018-2022), resulting in a market volume of IDR 11 trillion (USD 785 million) in 2022. The largest class of medical imports is medical consumable products. Due to the ageing population and prevalent elderly diseases in Indonesia, such as hypertension, diabetes, stroke, arthritis, cardiovascular issues, and other chronic diseases, there are immense demands from the medical device and healthcare markets. This sector is estimated to exceed USD 1 billion or equivalent to IDR13.5 trillion. Among these figures, foreign products take over 95 per cent of the market, with only 5 per cent of local products. Indonesia relies on imported medical devices and supplies to meet local demand, particularly from the rising middle class. The total worth of imported medical equipment increased from IDR 10.1 trillion (USD 726 million) in 2015 to IDR 14.5 trillion (USD 1,035 million) in 2016, and finally reached IDR 28.4 trillion (USD 2,030 million) in 2018. The imported medical equipment and devices are geared towards sophisticated medical instruments and infrastructure such as lasers, CT scan and other diagnostic equipment. On the other hand, domestic medical device producers mostly manufacture basic items, for examples, surgical gloves, bandages, orthopaedic aids, and hospital furniture. However, since 2016, Indonesian firms also became the makers for complicated instruments, such as sphygmomanometer, stethoscopes, urine catheter, infant incubator, nebuliser, dental chair, EKG, blood-grouping reagents, and first-aid boxes, and kits. 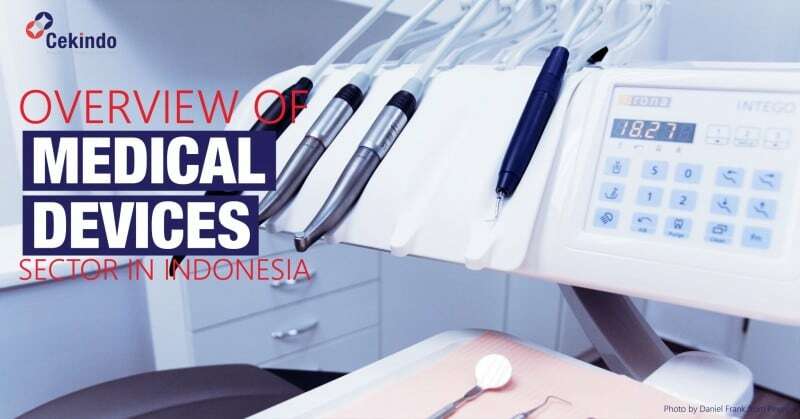 Besides, local medical equipment manufacturers in Indonesia have begun to engage in mid-range technology with more affordable pricing catering to middle-income groups, such as ultrasound devices and X-ray. As a result, more competitiveness has since been generated to strengthen the middle-class healthcare and medical devices, in terms of volume and value. Local firms such as Indofarma and Kalbe Farma, have diversified their product portfolio and are no longer just pharmaceutical manufacturers, took the lead and developed their medical devices for sale in the country. Several other local firms and innovators also participated in the IndoHCF Award 2017, showcasing their medical device innovations in regards to heart and kidneys examination. According to the Ministry of Health, it is expected that local manufacturers of medical devices can fully master the technology of middle-class medical and healthcare devices by 2035. The registration of medical devices falls under the regulation No. 1477/C/SK/IV/91, supervised by the Indonesian Director General of Food and Drugs under the Ministry of Health. Indonesia’s Ministry of Health is responsible for bidding all public hospital procurement for disposable medical supplies and medical devices. Many new private medical institutes and clinics have been opened in major cities, experiencing significant growth despite the economic slowdown. Most medical expenses are in the private health care system, accounting for 53.4 per cent of overall healthcare spending. The island of Java offers a higher standard of medical care in Indonesia, especially in the capital – Jakarta. The need for high-quality medical services has led to the establishment of small and state-of-the-art private hospitals. As of 2016, Indonesia has a total of 2,601 hospitals–988 privately owned and 1,613 managed by the public sector, according to the Ministry of Health in Indonesia. In 2017, investments in the medical service industry of Indonesia spiked as much as seven-fold to IDR 4.7 trillion (USD 343 million) in 2017 compared to 2016. The soaring investments came from both new and existing local businesses, as well as international companies. There were 27 new firms entering Indonesia’s medical device industry of Indonesia in the same year, raising the total number of firms in this industry to 242. These new companies produce a total of 294 different medical types of equipment and related products. The most recent investments in Indonesia’s medical device industry are an IDR 91.5 billion (USD 6.7 million) coronary stent manufacturing plant in Tangerang, Banten; and an IDR 16.8 billion (USD 1.2 million) surgical suture factory in Cikarang, West Java. Even medical products distributed in Indonesia are not exempted from Halal registration. Feel free to contact us for a free quotation on entering the Medical Device market in Indonesia. Fill out the form and we’ll reply you with a quote and overview of the process in your industry.